(Central Islip, N.Y., July 2, 2016) – The Long Island Ducks defeated the Sugar Land Skeeters 6-1 on Saturday night in the middle game of a three-game series at Bethpage Ballpark. 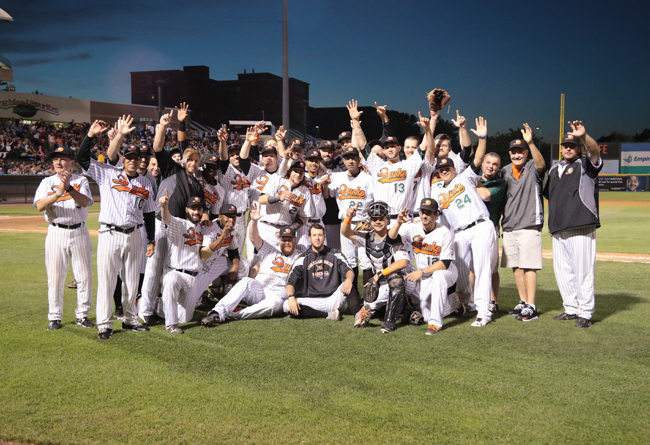 With the victory, the Ducks have clinched the First Half Liberty Division title and a guaranteed spot in the 2016 Atlantic League playoffs. The Ducks have earned their fifth First Half Division title in franchise history and first since 2012. Overall, this marks Long Island’s 11th postseason appearance in 17 seasons of play. The 2016 Liberty Division Championship Series will begin on Wednesday, September 21 at a location to be determined. Playoff tickets will go on sale at a later date, and fans are encouraged to stay tuned to LIDucks.com for more information. John Brownell (5-3) led the way for Long Island on the mound to earn the victory. In doing so, he becomes the winningest pitcher in franchise history with 41, surpassing left-hander Randy Leek’s total of 40 which he set from 2007-10. The right-hander pitched eight and one-third innings of one-run ball, allowing seven hits and two walks while striking out six. Sugar Land took a 1-0 lead in the fourth inning on an RBI double by Ricky Hague off Ducks starter John Brownell. Long Island responded in the bottom of the inning with a two-run home run to left field by Dan Lyons off Skeeters starter Aaron Thompson. A throwing error in the seventh scored Ruben Gotay, extending the lead to 3-1. The Ducks kept the offense going with three more runs in the seventh to take increase the advantage to 6-1. Lyons’ RBI single scored Fehlandt Lentini, Cody Puckett came home on a throwing error and Mike Dowd capped the inning with an RBI single. Sugar Land put two runners on in the ninth, but Todd Coffey recorded the final two outs to seal the win. Lyons led the Flock with two hits, three RBI and two runs. Dowd added three hits and a run batted in.